ID of this node This is the identifier assigned by the Netwok2080 backend. Whether the node is up to date This indicates that the node (and its children) are fully loaded. Whether the node has children Note that this also applies to children that aren't currently loaded. This returning TRUE will result in an expandable node even if there's nothing in the tree under it yet. Get the URL to retrieve the children of this node. Generates a random identifier and returns it Used when we want to create a new item, but don't know what ID to give it. Generate an UUID based on a S32 to an UUID form This is done to convert IDs sent by the server This of course is affected by endianess, but it doesn't matter as this is for local use only. Bridge for the tree nodes This class defines the behavior of the nodes, and adds members for specific information related to the content of the node. Definition at line 44 of file llfloaterproject.h. Definition at line 55 of file llfloaterproject.h. References getRandomID(), makeID(), mID, and mUUID. Definition at line 75 of file llfloaterproject.h. Definition at line 330 of file llfloaterproject.cpp. Definition at line 99 of file llfloaterproject.h. Definition at line 300 of file llfloaterproject.cpp. Definition at line 316 of file llfloaterproject.cpp. Definition at line 167 of file llfloaterproject.h. Definition at line 86 of file llfloaterproject.h. Definition at line 83 of file llfloaterproject.h. Reimplemented in LLNetwork2080FolderBridge, LLNetwork2080PlayableContentBridge, and LLNetwork2080PageBridge. Definition at line 87 of file llfloaterproject.h. Definition at line 73 of file llfloaterproject.h. Referenced by LLFloaterNetwork2080::addNode(), and LLFloaterNetwork2080::selectionCallback(). Definition at line 127 of file llfloaterproject.h. Definition at line 77 of file llfloaterproject.h. Definition at line 78 of file llfloaterproject.h. Definition at line 82 of file llfloaterproject.h. Definition at line 84 of file llfloaterproject.h. Definition at line 179 of file llfloaterproject.h. Definition at line 139 of file llfloaterproject.h. Referenced by LLFloaterNetwork2080::LLFloaterNetwork2080(), and LLNetwork2080Bridge(). Definition at line 191 of file llfloaterproject.h. Reimplemented in LLNetwork2080PlayableContentBridge, and LLNetwork2080PageBridge. Definition at line 173 of file llfloaterproject.h. Definition at line 85 of file llfloaterproject.h. This value is only relevant if isUpToDate() is FALSE. In this case the value returned by this function determines whether this node is expandable. Definition at line 125 of file llfloaterproject.h. Definition at line 101 of file llfloaterproject.h. Definition at line 98 of file llfloaterproject.h. Definition at line 93 of file llfloaterproject.h. Definition at line 94 of file llfloaterproject.h. Definition at line 91 of file llfloaterproject.h. If FALSE, then hasChildren() determines whether the node is expandable. If TRUE, then the presence of visible children in the tree determines whether the node is expandable. Definition at line 114 of file llfloaterproject.h. Definition at line 153 of file llfloaterproject.h. Referenced by LLFloaterNetwork2080::addNode(), LLNetwork2080Bridge(), and LLFloaterNetwork2080::requestChildren(). Definition at line 295 of file llfloaterproject.cpp. Definition at line 251 of file llfloaterproject.cpp. Definition at line 305 of file llfloaterproject.cpp. Definition at line 325 of file llfloaterproject.cpp. Definition at line 270 of file llfloaterproject.cpp. References llendl, llinfos, and openItem(). Definition at line 290 of file llfloaterproject.cpp. Definition at line 284 of file llfloaterproject.cpp. References llendl, llinfos, and TRUE. Definition at line 277 of file llfloaterproject.cpp. References FALSE, llendl, and llinfos. Definition at line 90 of file llfloaterproject.h. Definition at line 185 of file llfloaterproject.h. Definition at line 79 of file llfloaterproject.h. Definition at line 310 of file llfloaterproject.cpp. Definition at line 47 of file llfloaterproject.h. Referenced by LLNetwork2080FolderBridge::getChildrenURL(), getID(), LLNetwork2080PageBridge::getURL(), LLNetwork2080PlayableContentBridge::getURL(), LLNetwork2080Bridge(), and LLNetwork2080FolderBridge::openItem(). Definition at line 49 of file llfloaterproject.h. Referenced by getDisplayName(), and getName(). Definition at line 50 of file llfloaterproject.h. Referenced by getSortOrder(), and setSortOrder(). Definition at line 48 of file llfloaterproject.h. 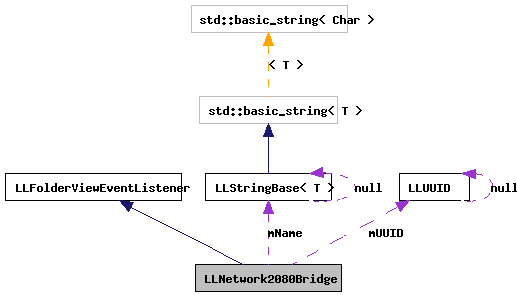 Referenced by getUUID(), and LLNetwork2080Bridge().